Ok, so I can't take credit for these amazing scrambled eggs at all! I found the recipe here at the lowcarb friends messageboard. They are an amazing bright green color and taste great. 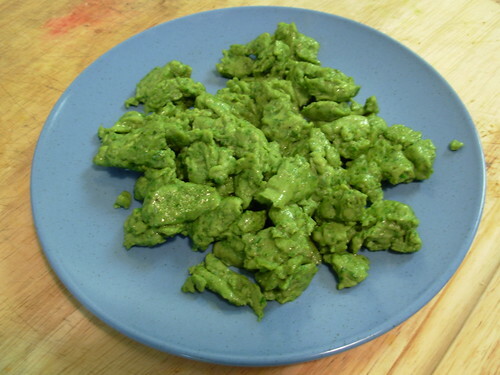 Use the proportions of 1/2 cup raw spinach and 1 T coconut milk to 1 egg. Put all the ingredients in a blender or magic bullet and puree. Then just scramble like normal in whatever your preferred cooking fat is. Oooh, very intriguing! I made my sister buy me some spinach when she went to the store so that I could try them in the morning. I'll try this with arugula instead; spinach has too much oxalic acid for me. Lol, I love it! Anything (naturally) green is great, but your eggs here look very appetizing, especially since I forgot my lunch today ;) I love the title. So incredibly cool, Elizabeth! Am making up some green eggs for dinner. What a great way to get your greens in! I couldn't decide what I wanted for breakfast so I decided to come back to your blog for ideas, and I just had to try these when I saw them. They were awesome! I'll probably have them all week (or until I run out of spinach, lol. Thanks for posting!